Casa Colli B&B is located at 300 meters from Venezia/Mestre train station where you can find all the buses terminals to Venice Historical Center ( only 5 minutes) running 24 houres a day, Venice and Treviso airport, Padova, Riviera del Brenta and also the taxi’s station and a Garage/Parcking covered and guarded open 24 houres a day. Casa Colli B&B offer to their clients beautifules rooms, all with ensuites bathrooms doted of hair-dryer and courtesy set, the most modern comfort like personal air conditioned and heating control, TV, internet connection wireless, frigobar (empty or full on request), kettle with coffee and tea facilities to satisfy our customers travelling for pleasure or for work. Continental breakfast will be served, but on request you can customise it at your test. For families, compagnies and friends who will keep their on autonomy, you also can boocked all our structure in exclusivity, even the kitchen on anticiped request. Transfert from/to Venice and Treviso airport, Auto and boat rentals with/without driver, Covered and guarded parcking, Babby-sitting, Venice and Island tours, Multilanguages guide services, Laundry services, Italians and foreigners news-papers. We also organise cruises (charter) with skipper by 14 meters seal boat composed by 4 double-rooms, 2 bathrooms, sitting-room and kitchen. We also provide other services, please contact our concierge. A Casa Colli B&B offer to their clients beautifules rooms, all with ensuites bathrooms doted of hair-dryer and courtesy set, the most modern comfort like personal air conditioned and heating control, TV, internet connection wireless, frigobar (empty or full on request), kettle with coffee and tea facilities to satisfy our customers travelling for pleasure or for work. Continental breakfast will be served, but on request you can customize it at your test. 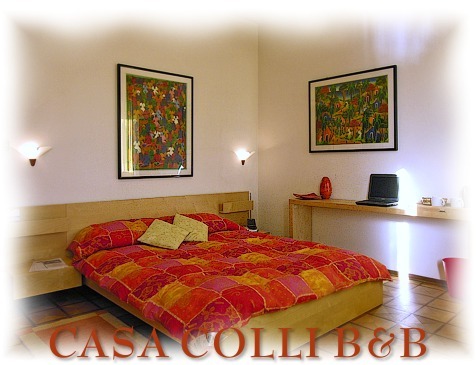 Casa Colli is surrounded by supermarket, farmacy, restaurants, shops and the train station with all the buses and taxi terminals for any directions. 30% as deposit by credit card at the moment of the boocking, payement of the balance at your arrival in the structure by Cash or Credit Card. - cancelation till 72 houres before your arrival lost of the 30% deposit. - cancelation after the 72 houres lost of the full boocking amount. - no show or cancelation in the 12 houres before your arrival lost of the 100% of the total of your boocking. Our structure is located at 300 meters from the Venezia/Mestre train station, principal street (Via Piave) in front of the exit/entrance of the train station, stay on the left part of the street until you arrive to a farmacy, just turn left after it and the first windows/door is the Casa Colli B&B entrance. We are on top of the farmacy.